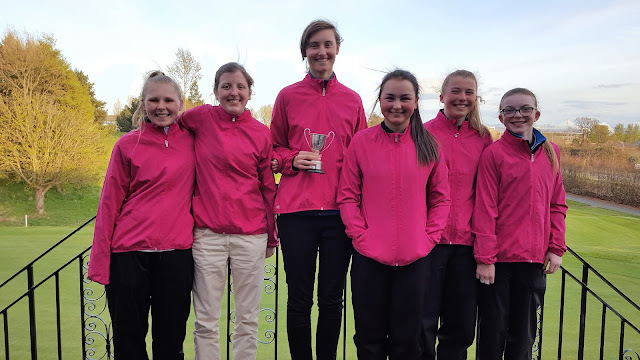 Fife County girls celebrated the 60th Anniversary of the competition for the Cuthbertson Cup on Saturday 15th April at Pitreavie Golf Club, Dunfermline, by winning it for the first time since 2005. They were in great form, winning every game. Stirling &Clackmannan were worthy runners-up having reached the Final after a count back against East Lothian who took third place with defending champions, Midlothian, finishing fourth. Annabel Hosie lost to Natalie Fowler 3 and 1. Lauren Lee bt Morgan Graham 3 and 2. Catherine Milne lost to Katie Liddle 4 and 3. Grace Crawford bt Orla Fitzpatrick 3 and 3. Anna McKay bt Eilidh Crawford 3 and 2. Evanna Hynd bt Carys Irvine 2 and 1. Porscha Wilson bt Alex Massey 2 and 1. Eilidh Henderson bt Samantha Macgregor 2 and 1. Natalie Fowler lost to Anna McKay 4 and 2. Morgan Graham lost to Evanna Hynd 5 and 4. Katie Liddle lost to Porscha Wilson 2 and 1. Orla Fitzpatrick lost to Eilidh Henderson 8 and 6. Annabel Hosie and Lauren Lee halved with Eilidh Crawford and Carys Irvine. Catherine Milne and Grace Crawford bt Alex Massey and Samantha Macgregor 1 hole. 1 Fife, 2 Stirling and Clackmannan, 3 East Lothian, 4 Midlothian.